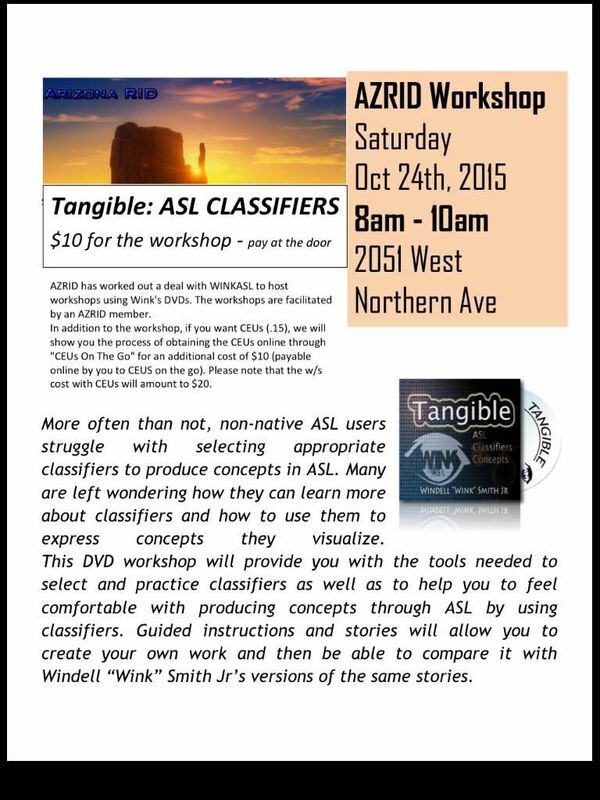 Arizona RID has worked out a deal with WINKASL to host workshops using Wink's DVD's. The workshops are facilitated by an Arizona RID member. In addition to the workshop, if you want CEUs (.15), we will show you the process of obtaining the CEUs online through "CEUs On The Go" for an additional cost of $10 (payable online by you to the CEUs on the go). Please note that the workshop cost with CEUs will amount to $20. Hello there membership! Come on out to our annual Arizona RID membership meeting held after our Arizona RID workshop from 8am-10am. We are experiencing many changes and challenges in our field it is critical that we remain collectively involved in matters that impact our work. When unified and as a whole we can do great work. See you all there!